It’s December, so Christmas is officially a-coming! Whilst I still have a LOT of Christmas/Hanukkah shopping to do (thank goodness for Amazon Prime hey), when it comes to festive recipes I seem to be pretty organised this year. I can’t wait to share them all with you! This recipe came about as I was thinking about how delicious and Christmassy mince pies are, but sadly I can’t eat most shop-bought ones as they tend to be loaded with gluten, dairy and sugar. I wanted to make my own healthy mince pies for a dinner party I was hosting the other day, but was really pushed for time. So I decided to scrap the idea of the pastry (as that’s the time consuming part) and go with a mince pie crumble instead. It literally took me all of about 15 minutes to prepare, and then you just need to pop it in the oven to let it do it’s thang. It went down so well with my guests, and they all thought it was such a creative idea too. Little did they know it was just an easier and quicker version of making my own mince pies! 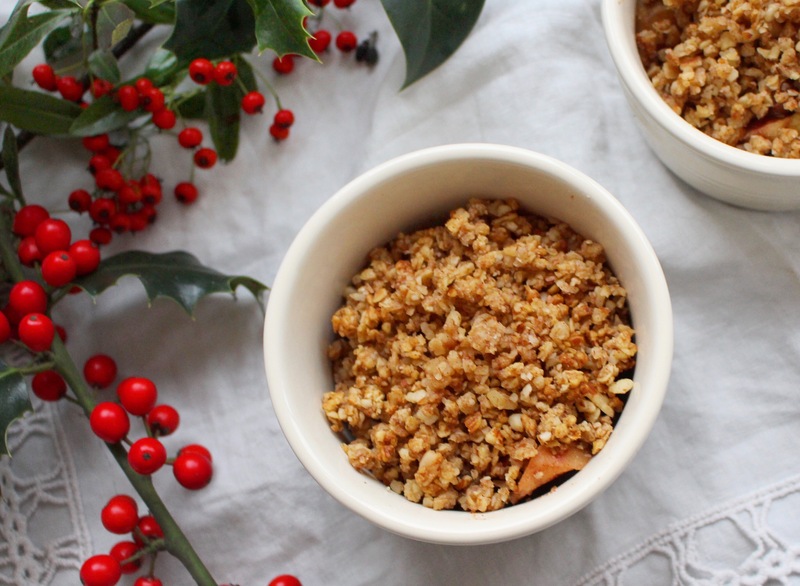 Spoon the apple mince mixture into a crumble dish or individual ramekins and put to one side while you make the topping. For the crumble topping, first blitz the almonds in a food processor for around a minute or so, until they form a coarse flour. Pop the almonds in a mixing bowl alone with the oats. In a saucepan, melt the coconut oil, then spoon in the maple syrup and cinnamon and stir well. Pour this mixture into the bowl with the almond flour and oats and give it a good old mix for a minute or so. Then your topping is ready! Spoon it evenly on top of the apple mince and press down with a spoon so make sure it all sticks together. 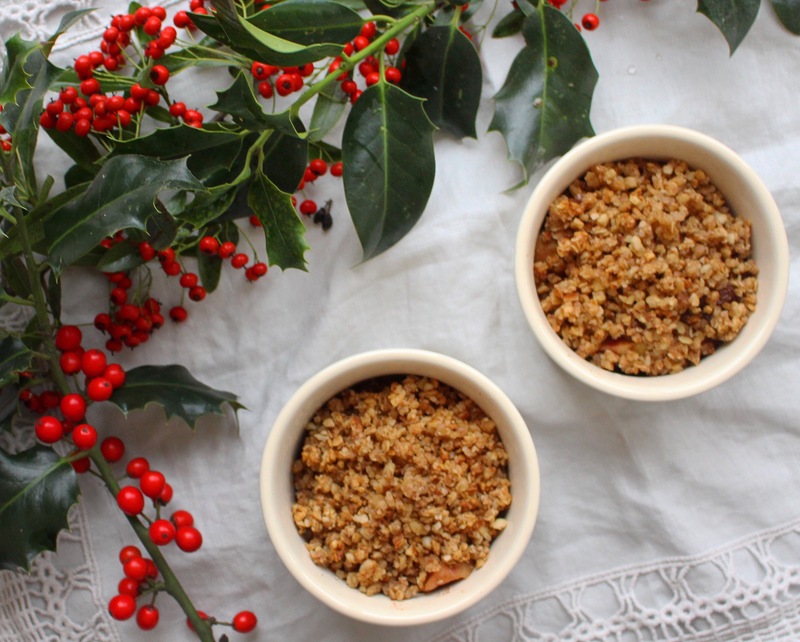 Pop your crumble dish or ramekins in the oven and bake at 180 degrees for 15-20 minutes, or until the crumble topping turns golden and crunchy. Serve with coconut yogurt or some of our healthy ice cream and you’re good to go – happy feasting!